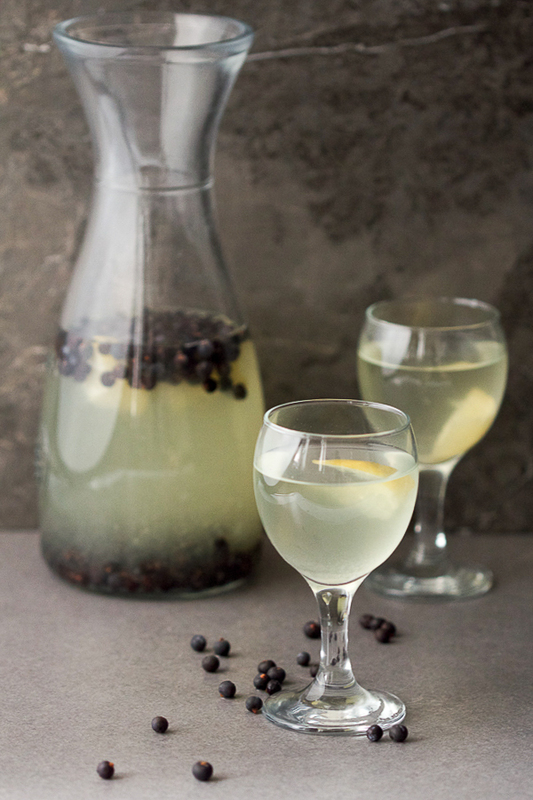 Fermented Juniper Berry Juice (aka smreka), is a sour and refreshing, lemonade-like beverage, perfect for quenching the thirst on a warm evening. Almost everyone who comes to Sarajevo in late spring is surprised by the variety of unusual yet tasty homemade juices available at local cafes. Come May, there’s the ubiquitous zova made out of the elder tree flowers (also known as zova) which blossom around that time. There is also the fantastic rose juice (sok od ruže or djul šerbe), made from local wild rose petals. 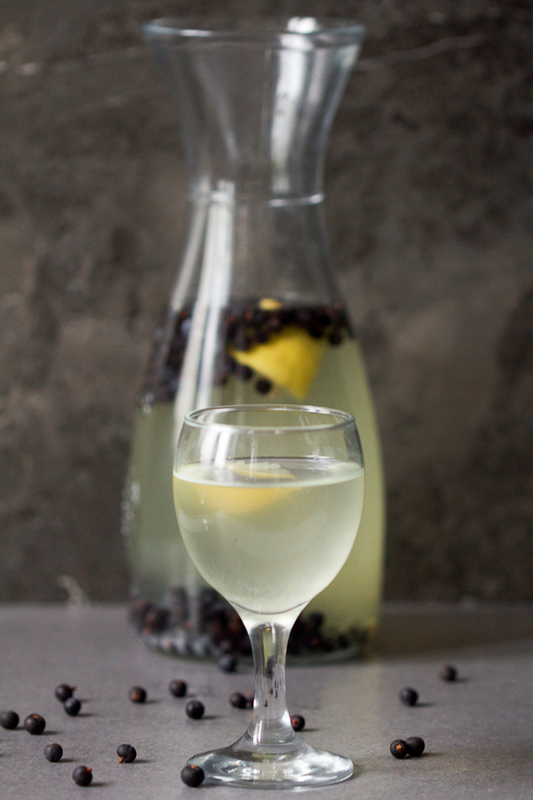 And then there is smreka – the fermented juniper berry juice. Have you tried it? If not, you should! Because smreka is simply perfect. 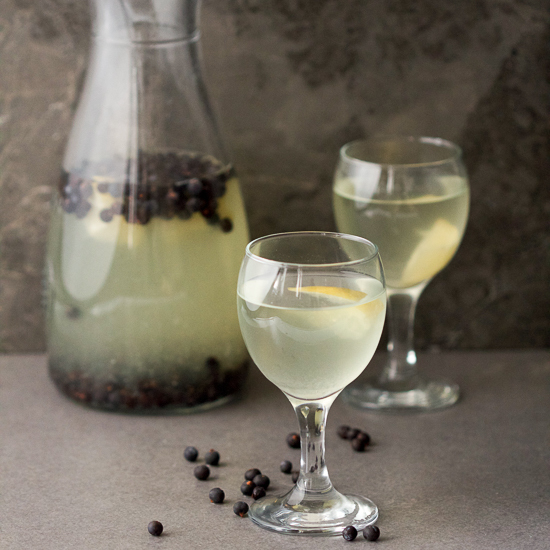 Although the mention of fermented plants evokes the taste of sauerkraut, think of juniper berry juice as a “more sour than usual” lemonade that can be consumed as is, or made sweeter with honey or sugar. It’s very refreshing, and perfect to go along with local desserts such as the walnut stuffed apples (tufahije). People take to smreka quickly, and some make their own after returning home. I’ve had a few requests for a while, and below is the recipe I’ve used with great success. 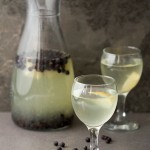 In addition to this juice, juniper berry is known for being an active ingredient in several other Balkan delicacies, including the homemade juniper berry brandy (rakija klekovača), as well as gin. The plant itself is said to have many different health benefits, and is widely used in the area. The juice is an excellent diuretic, and is also recommended as an aid against coughing, asthma, stomachaches and uti’s. It’s said to be especially effective for stomach problems of all sorts, and is often recommended by the doctors here to patients suffering with kidney stones. When made into oil, juniper berries are excellent to use in massaging areas affected by the rheumatoid arthritis. P.S. We’ve done additional interesting beverages before. Do you remember sour cherry liqueur? Or the elderflower cordial? 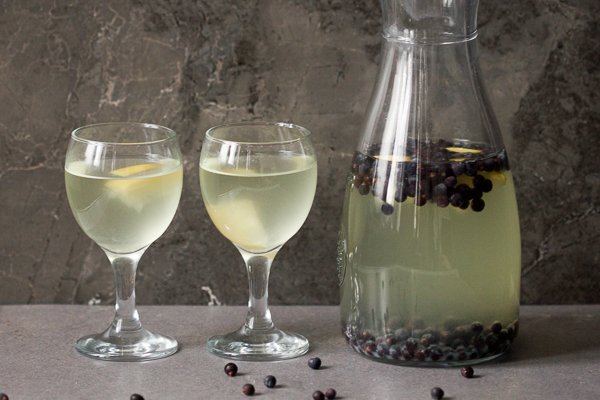 If you don’t feel like fermenting drinks, how about some white wine lemonade? Recipe provided by Samir Hajdarević. Wash lemon well, and quarter it leaving the skin on. Combine with juniper berries and place in a large glass 1-liter bottle (or jar). Fill with water all the way and close the lid loosely. Leave bottle in a sunny and warm spot on the window seal (or the terrace), for 10-15 days. 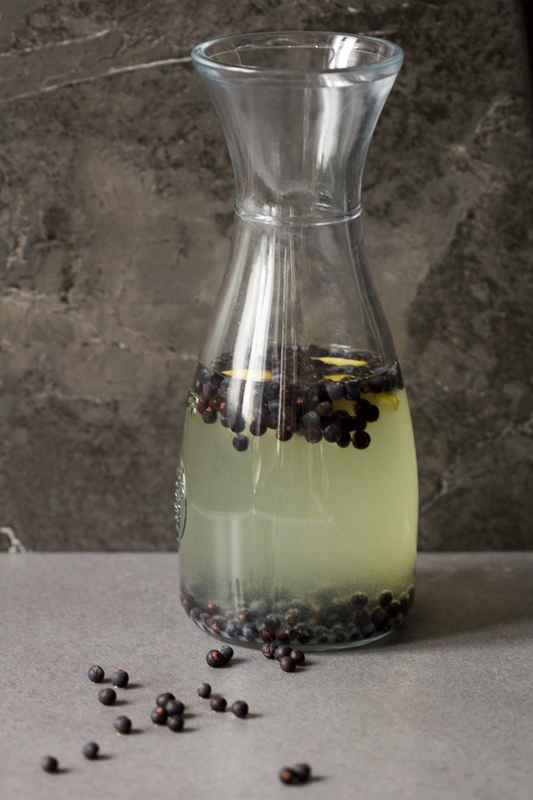 A lot of juniper berries will start sinking to the bottom, or travel up and down in the bottle, while water will become yellowish. This is your sign that the juice is ready. Strain the juice, transfer to a different bottle, and keep in a cold place. When getting ready to consume the juice, taste and see if it’s to your liking. If it’s too strong, dilute with a little bit of regular or mineral water. Add a teaspoon of sugar as well if you prefer. Meanwhile, repeat the process to make more juice with the same berries. Transfer them back into the original bottle, add a new quartered lemon, fill them up with water, and leave in a sunny spot. You can reuse berries once or twice. When most of them stay on the bottom, and the juice is no longer flavorful, they’re ready to be discarded. The berries sometimes travel up and down the jar. If you’ve used a lot of berries, a lot may not even fall to the bottom before the juice is ready. That’s fine. Tasting the juice, and discovering its tart, sour and refreshing flavor is a sign smreka is ready to be consumed. 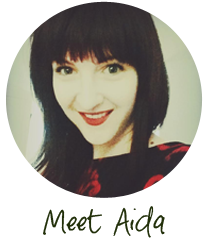 I would love to try this juice…You have beautiful blog. Thank you Zoki, and thanks for stopping by. It’s very easy to make, and I’m sure you’d like it. do you use fresh or dry juniper berries? also if you want to add sugar do you add it after the juice is ready? Hi Jen, thanks for stopping by. Dry juniper berries are used. (Correction added.) Yes, add sugar after the juice is ready. What are the health benefits of this juce, kindly tell me where can I find the organic juniper berries, also tell me if the are edidble,and good for human consumption . Can they cure diabetes, I heart juniper berries produce insulin is that true. Waheed, try amazon. They’re in season during the summer. Sellers may charge more for them this time around. Thank you for this recipe. I am impressed with the taste of the juice and will be making it often. Glad it turned out well. Thank you for taking the time to let me know. 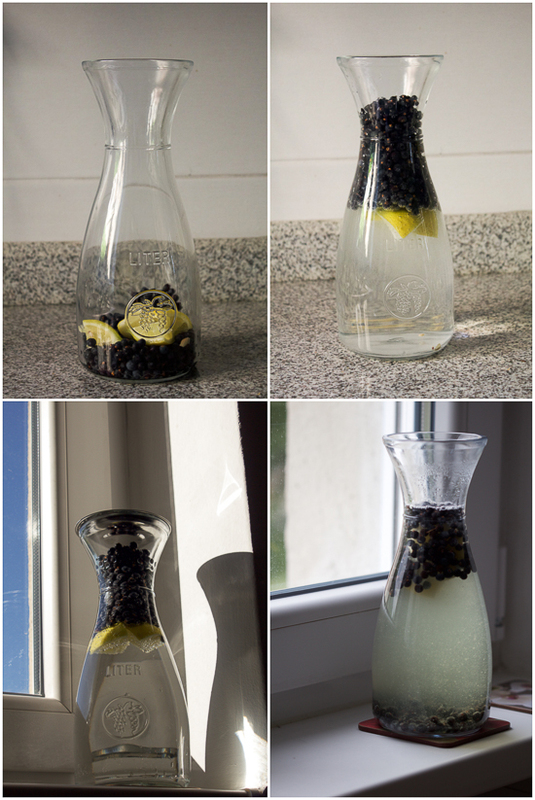 This looks fab – I’ve never seen anything about fermenting juniper berries before, so thanks for sharing! Hey Emma, great profile photo! Thanks for stopping by, and I hope you make this juice. It tastes amazing, and it’s healthy too. I would like to share with you the way we prepare this drink in Albania. Here we call it Hardiç (pronounced harditch, and don’t ask me about the name’s etymology cause I don’t know). It is similar to your way but it takes a little more space and time. On the other hand you will have enough for the whole winter or so. In a 40 liter plastic container (or even metallic but produced for food containing purposes) ad 2kg of fresh juniper berries. Try to not include green ones as they may negatively influence the taste. Fill the container with potable water and close the lid without force-closing it since the fermentation will increase the volume of the content and may explode the container. Leave it in a fresh place for 40 days. Afterwards you can try the taste, and if it seems ok start using it. You need to filter the juice with a thin sieve or even with a piece of textile. If the container comes with a tap be sure to put a filter from the inside already at the beginning. Every time you take juice from the container you can add the same amount of potable water to it. This should go on for as long as the taste remains the same. When you feel it doesn’t taste any more like before it means the juniper berries are ready to be discarded. Doian, thank you for leaving such a thoughtful, long comment. I love hearing how similar stuff is prepared across different places. You know I never thought about making a batch that big, but it makes sense. If we ferment vegetables in large buckets, I guess we could do it with juniper berry juice too. We ferment for a much shorter period of time though. Not sure if the size of your bucket has to do with longer fermenting period. Good point about not using the green berries! Cheers! Sorry, in my previous comment there’s a mistake in the recipe: not 2kg of juniper but 12kg of juniper berries. I have been preparing a modified version of this drink for the last 5 years. As it takes more than a month to complete the fermentation process, I find it impractical to make small quantities such as 1L. I make 10L batches and the only reason why I don’t go with larger qty’s is price of berries. I live in Canada and usually bring berries from Bosnia, few kg each year, which is insufficient to go with the concept proposed by the poster from Albania – 12kg berries in a large 40L barrel (thank you for posting it). While price of berries in Canada is sort of high, around $30/kg, for rather pretty mediocre quality (and they are actually imported from Balkans). Otherwise, I would love to be able to do it in a 50L barrel and just keep adding water as the good stuff is being consumed rather than keep constantly making 10L jugs for several thirsty mouths :). From a Bosnian village where I came from, the original recipe included 5L jars with approx 300gr of juniper berries + some rose hip fruit (sipurak) and few slices of some sour apple, properly sealed and to be left in a warm place, such as a sunny window for 3-4 weeks. I modified this process by adding some other dry fruits as well and also having a 2 step fermentation, 3 weeks with berries and fruits at a warmer place (23C) in and 3 weeks without at a bit lower temperature (20C). Due to sugar in small amount of other dry fruits I add, my ready to drink juice has approx 0.5% of alcohol, which only improves quality of the product :). Thanks for sharing your fantastic recipe. Smreka – like ajvar and pindjur – is a delicacy everyone adds a personal touch to. I like your idea of adding other fruit – I’ll experiment with it. Other fruits I use are wild dry cherries (Bosnia), wild dry blueberries (Bosnia), wild dry grape (Canada) all of which add some taste and also a lot of red color, then tamarind (for sour taste), or dates, raisins, dry apricots (Turkey) all of which add mostly sugar. Sometimes lime or lemon. Occasionally wild sour apples when I find some (which I also use to make another specialty from my village – they make apple vinegar only from those small, zero sugar, very sour wild apples – zukve). And if you want to carbonize the drink, obviously mixing it with sparkling water works, but what also works is to pack the juice in 1L glass or plastic bottles, add a bit of honey (~15gr), use a good cap or plug and leave it for couple weeks. When you open, it will foam like beer :). Obviously, you can use sugar instead, but honey adds a bit of flavor. Fermented honey alone is also one of the old recipes, mead (medovina). I’m also thinking of getting 1 gallon CO2 pressurized dispenser for tursija. I presently keep it in 1 gallon glass jugs, but a dispenser would be more convenient for “handling”. I am so happy I finally found your recipe I had searched the internet for hours to find out what I could do with these berries. All they seemed to give me, was how to cook with them. Can you tell me what the Health benefits are for drinking the juice? Wilhelmina, what a gorgeous name! Glad you found use for these berries. This juice is fantastic. I do not have credentials in nutritional medicine therefore I couldn’t dispense any advice regarding its health benefits. Here is a link for an article that talks about it though http://healthyeating.sfgate.com/medicinal-benefits-juniper-berries-7691.html. I tried to infuse juniper berries in avocado oil … I picked and washed/dried the berries; sterilized a jar, put the berries in to about 2/3 full and covered them with the oil by about an inch. I left it initially in fridge and shook it ever day but oil solidified. After 2 weeks, I placed the jar in a cook, dark place and shook it every day. About a week later I opened the jar and discovered they were fermenting and berries were sprouting. It smells very nice, but I have no idea what to do with it now. Do you or anyone know anything about this? Gisele, I’ve only used juniper berries for the juice. Perhaps make an essential oil out of it, for aroma? I feel so lucky to have access to a LOT of juniper berries locally, that’s how I came across the recipe (looking for uses). I have made my own Juniper syrup for pancakes as well as using in my soda machine, as well a Starbucks copycat juniper sage latte. Am eager to try this out, thanks for sharing! Nice! Juniper syrup sounds delicious. Let us know if you make smreka and if you like it. The first time I tried this recipe was in 2017, I went to Sarajevo for a short trip in May and that was when I saw a big jar in a restaurant; a restaurant that still stands from the boom where a lot of restaurants had opened around Bjelasnica to service the Winter Olympics 1984. That was before I was born; but have lived to tell the tales after we had to leave our house in 1992. I made my first Smreka back in Australia, with the berries I had for a while. I shared it with the love of my life. It was delicious. It is 2018 and I made my second Smreka. I left it for 6 weeks though, because it looks so pretty and I would rather watch it than drink it. Today I decided to have a sip. How long before I should be worried that I have developed harmful bacteria? I found a gray film on the surface. If I boiled it to kill bacteria, would it ruin the chemistry? Great to hear about you encountering smreka for the first time at a restaurant near Bjelasnica, and thanks for sharing your life story with us. Smreka fermenting depends on the temperature. If it’s summer it takes a shorter amount of time, while winter months require a little bit longer. So, dump that batch, get some more berries and repeat the process. Except this time around shorten the fermenting period. You can reuse those berries one or two more times. Love from, currently very sunny, Sarajevo.